IIX has made its first acquisition following a $10.4 million Series A this summer. The company has acquired Allegro Networks in the UK for an undisclosed amount. IIX said it was attracted to Allegro’s connectivity automation capabilities and talent. It also gains more than 30 Allegro network Points of Presence (PoPs) in the UK. IIX wants to make international network peering simple through distributed and interconnected Internet Exchange Points (IXPs) and believes it has the platform to make this a reality. 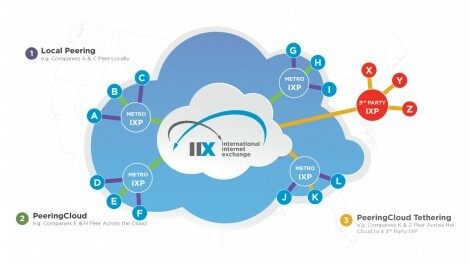 The company describes its PeeringCloud is a global Internet exchange platform that enables customers to connect to IXPs via a single interconnection from anywhere in the world. IIX is making a case for distributed and interconnected IXPs and moving away from the interconnection “islands” that currently exist, where certain data center providers control the major interconnection points. Members of an industry group called Open-IX are promoting another model of Internet exchanges that extend beyond a single data center. AMS-IX, operator of the Amsterdam Internet Exchange that this year expanded into the U.S. market is an Open-IX member, but its model limits each distributed exchange to a single metropolitan area. This is different from the global exchange model IIX has devised. Allegro is a UK-based software and interconnection company that IIX believes will further its mission of providing global network interconnection services to enterprises that are easy to set up. IIX and Allegro are aligned in their desire to eliminate the manual labor of setting up a range of connection types by distributing the platform and offering it through software instead. Enterprises continue to adopt hybrid strategies employing a variety of architectures dictated by specific applications' needs. This requires being able to configure infrastructure dynamically, which is only possible through software. "Our two organizations share the same philosophy, believing that the ability to provision scalable, reliable, and secure interconnects will power new innovation for the benefit of online users,” said Davidson. IIX’s platform is not an overlay product, but a complete bypass of the public Internet. By bypassing the public Internet, it improves latency, increases immunity to DDoS attacks and mitigates other issues. Allegro’s automation platform Snap allows organizations to purchase and provision virtual cross-connects, point-to-point circuits and peering interconnections on demand. Allegro's engineering talent is crucial to the deal, as they will help evolve the platform. Allegro CTO Andy Davidson has been appointed IIX president of network engineering, Europe. He now joins a team of experts with deep roots in the network peering industry. IIX founder and CEO Al Burgio has quietly built a major contender. His team includes some Equinix veterans, including Bill Norton, co-founder of Equinix and published author on peering, Morgan Snyder, who spent a decade with Equinix, and advisory board member Jay Adelson, Equinix founder and co-creator of PAIX, formerly known as the Palo Alto Internet Exchange. Equinix, by far the largest incumbent in the commercially-operated Internet exchange space in the U.S. is the biggest competitor of both IIX and exchange operators that participate in the Open-IX initiative.